I obtained my Rheumatology subspecialty certificate from the Royal College of Physicians, South Africa, in 2012 and worked as a full-time rheumatologist for four years before moving to Canada in July 2017. It has been a year now since I began to practice adult general rheumatology in Saskatoon. 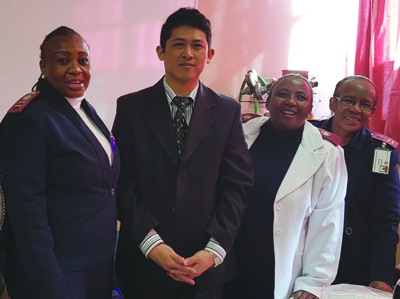 In this article I highlight the differences that I came to notice between the healthcare systems of Canada and South Africa in the field of rheumatology. South Africa has a two-tier healthcare system: one is the public system with limited funding which caters to the majority; and the other is the better-resourced private system. I worked at a tertiary hospital under the public system in South Africa, and my patients were almost entirely indigenous South Africans. I had no experience with the private system. One major difference between the two countries is the way in which record-keeping and referrals are organized. Whereas in Saskatoon computers and the internet are used for keeping track of patient records and referrals, everything is hand-written in South Africa. The spectrum of disease is also different. For example, I had never seen a case of polymyalgia rheumatica (PMR), remitting seronegative symmetrical synovitis with pitting edema (RS3PE), giant cell arthritis (GCA) or ANCA-associated vasculitis during my four years of practice in South Africa. All of these are frequently seen in Saskatoon, especially PMR, RS3PE and GCA. Ankylosing spondylitis and psoriatic arthritis were rarely seen in my South African patients over four years, yet I have diagnosed and managed several cases in just one year in Saskatoon. The most common inflammatory conditions that I treated in South Africa were rheumatoid arthritis and gout. Sjogren’s syndrome is rarely seen among South African patients, with only one case over my four years of rheumatology practice. Another significant difference I noticed between the two countries is the availability of treatment options. While I now have easy access to almost all appropriate biologic therapies here in Saskatoon, only two were available to me in South Africa (etanercept and rituximab for rheumatoid arthritis). Lastly, but not least important, responsibility for treatment decisions is usually shared with patients here in Saskatoon, whereas it was mostly mine alone in South Africa. There is generally a lot more discussion and negotiation with patients before treatment initiation in Saskatoon compared to South Africa, where patients tend to simply accept the treatment their physician thinks is best for them. I personally find satisfaction working in both places, albeit in slightly different ways. The staff of the rheumatology unit at Dr. George Mukhari Academic Hospital. From left to right: S. Tselane, Dr. MTL (Tun) Nyo, D.J. Lebuso and M.C. Segoe.